Traditionally, pundits choose the quarter pole as a benchmark for assessing a team’s performance. The thinking is, 20 games provide enough of a sampling for accurate review and prognostication. Lesser men need 20, give us 19. This team’s identity has been forged in wet cement and we’re ready to lay our reputations on the line. The Canucks have 19 points through 19 games. Panic time for the defending Western Champs, right? But we all know this team doesn’t get going until December. After the 19-game mark last year, the Canucks had 23 points. So let’s all relax. This season’s incarnation has battled through the chemistry shakeup of a major trade, Roberto Luongo’s usual early fall slump and an injury to Ryan Kesler. After Vigneault’s latest bag skate, we’d bet the remaining pennies in our gambling accounts that the Canucks are going to go on a patented run soon. Let’s take a closer look at some of the performances this season. Shane: the OTHER Sedin. Which Sedin did you pick, Nolan? I’m taking the other one. It’s a shame these guys don’t get their due. Think about this: if two identical twin brothers both won league scoring titles in back-to-back seasons, but they played in New York? How much attention would that get??? Well, maybe none (due to Americans loathing our favourite sport), but could you imagine if the Sedins did this in Toronto?! How has ESPN not run the Sedin brothers as a feature story on Sportscenter or E:60? Like, every single week. Nolan: Danrik Sedin. They’re both amazing. You’re right Shane, we truly don’t appreciate how great they are. Daniel and Henrik have 23 and 21 points respectively. The next closest Canucks forward has 10. Shane: Chris Higgins. I love having Chris Higgins on this team. And it seems like I’m not alone; when watching a Canucks game at the pub and Chris Higgins makes a solid play, invariably, someone chimes in with “I love that guy.” This statement becomes a chorus of people saying “ya, dude”, “totally”, or “word that, homies”. Higgins doesn’t look out of place playing on the second, third or fourth lines, which makes him far more valuable than the recently departed Mikael Samuelsson -- who looked angry when he was anywhere other than the first and second lines. 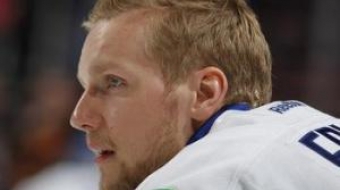 Nolan: Alex Edler. Edler sits fourth in the NHL in defenceman scoring. He leads the Canucks in ice time with almost 24 minutes a game. Though Edler has given up on the bone crushing hits, it’s a good sign that the Canucks have a defenceman capable of filling the offensive void left behind by Christian Ehrhoff. 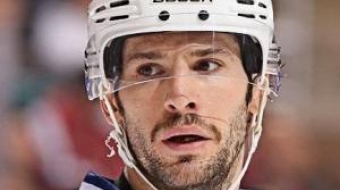 Shane: Maxim Lapierre. This goes hand-in-hand with my biggest disappointment (See below). Maxim (like Higgins) slots into the line up wherever you need, and he plays hard. Very hard. As hard as Manny Malhotra used to play before that devastating eye injury last season. The biggest surprise about Maxim’s game is that he seems to have found some scoring touch (with five goals thus far) and Lappy doesn’t seem to be as yappy as his nickname once implied. But it is a long season; I’m sure Lapierre will do something stupid eventually. Expect Mike Millbury and Don Cherry to replay and critique this eventuality multiple times, in a vain attempt to make people think the Boston Bruins aren’t a dirty team. Nolan: Cody Hodgson. Hodgson has an innate sense for the game. He always seems to find the open spots. Once his wrist shot and his skating catch up to the way he thinks the game, he’ll become an elite player for years to come. Shane: Manny Malhotra. I hate to say it, but the guy looks like he’s been playing scared. Fair enough. Athletes are used to overcoming injuries because it’s part of the job. Head or vision based injuries do not fall into this category. All other injuries, you heal, you recover, you come back when you are physically strong and ready to go. There is no “strong and ready to go” with a concussion or vision loss because it’s a mental, not a physical recovery. Recovering mentally is a different process than physical recovery; it can be a far more delicate process. Manny used to play each shift for the Canucks like his body came second, and the team came first. I don’t know if Manny will ever play with that attitude again. And without that attitude, he is a fourth liner. Which makes him an overpaid fourth liner. Nolan: I Conquer (holds up word-a-day Calendar). Manny is all class, and I’m really hoping he gets his game back soon. Shane: The Sedin’s will have a new (semi) regular line mate by the end of the season. Alex Burrows, your time is up. Don’t be sad, or mad, or French ... well, I guess you can’t help the last one. Coach V always tries out someone new with the Sedins each season, more to shake this up when they need a good shaking. Well, the Canucks need a good shaking, and they need it now. Alex Burrows will end up with Kesler on the second line, Cody Hodgson and David Booth end up on the third line and Hansen, Higgins and Raymond will move up and down those lines as Vigneault sees fit. Giving you three solid scoring lines and a fourth that feature Manny and Lappy? Nice lineup. 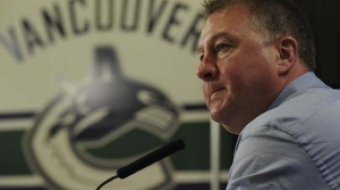 Nolan: The Canucks will win the President’s trophy. They’re eight points back of league leaders Minnesota with a game in hand. We’ve seen it before; this team gets hot like no other. The Canucks are going to tear off an eight game winning streak and go something like 23-5-2 in their next 30. Have faith.